The Galaxie was introduced part-way through the 1959 model year, so some of these cars are found at car shows labeled as a Fairlane 500 or a Fairlane 500 Galaxie. But with the mid-year introduction, a new Thunderbird-look and formal two-door fixed hardtop was the foundation of the Galaxie sub-series, with Sunliner convertible and Skyliner retractable gaining the nomenclature as well. Few recall that the Galaxie name and trim level was also applied to two- and four-door “post” and four-door hardtop body styles, as well. 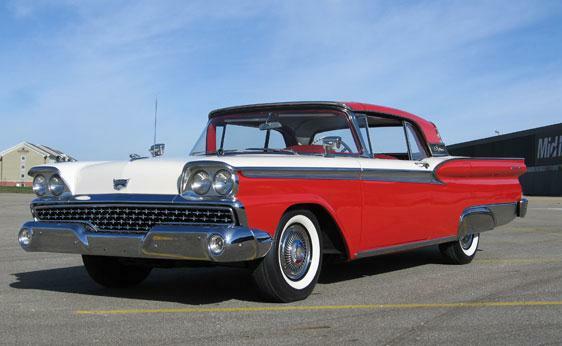 The ’59s were a conservative, yet popular car line that came extremely close to out-selling arch-rival Chevy’s all-new cars, despite being a reskin of Ford’s successful 1957-1958 cars. The Fords could be had with the large, high-compression FE block 352 cubic inch, 300-horsepower V-8, but most buyers opted for the more economical FE 332, with 225 horsepower, or the Y 292, with 200 horsepower. Most collectible are the Skyliner retractables; only 12,915 were built. They featured a specific frame that combined the heavier-duty construction of their Sunliner convertible brethren with an extended rear frame and extended rear quarter panels of a station wagon in order to make room for the retracting roof. Despite Continental kits fading slowly out of style, many aftermarket companies, including the ubiquitous JC Whitney, offered specific kits for these cars. One can only imagine how difficult it might have been to negotiate steep driveways with a Continental kit added to the back of a Skyliner!